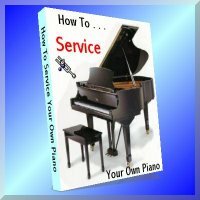 for easy access to all of my piano service information. Note: This is an electronic book that you download to your computer. You can then read it off line or print it out. Printed copies of the eBook are also available. Note: The printed copy is a loose-leaf printout of the electronic version, not a bound book. (except for the book on scale design which requires an internet connection to do the calculations). It is also available as an application for MAC computers. Only $87 for a limited time. -- that's a saving of $62.70! We accept payment with . . .